Parallel motion grippers represent a highly versatile and flexible design. The integral pneumatic cylinder pushes the jaws open. 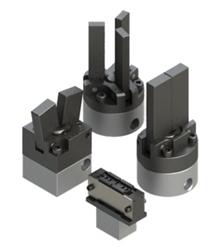 The jaws slide along two hardened guide rods providing rigid, long lasting true parallel motion.